A very notable introduction from Oregon, U.S.A. Black Beaute has the most enormous berries, which weigh in at a hefty 11 grams each - that's twice the weight of an ordinary cultivated blackberry. With their glossy black colouring and pleasant aroma, these collosal berries provide a most attractive sight at the tea table and are sure to win prizes at any show. 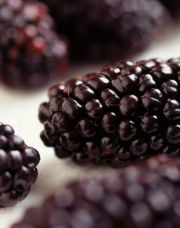 But Black Beaute is also a superb eating variety with very good flavour and fleshy, juicy fruits. These make an outstanding pie or preserve and are also ideal for juicing. Black Beaute is a pleasure to grow and pick, the vigorous trailing growth is easily trained and relatively sparsely prickled. We seldom introduce any new variety of exceptionally large fruit size as other qualities are often lacking. Not so Black beaute, the flavour, yield and eating qualities are all very impressive and we can recommend this quite unique new giant Blackberry to you with every confidence.